Back today with another instalment of Chronic Confessions! I’m really loving this series, I feel like I’m learning so much about others conditions. One of my main aim with the series was to educate people and they seem to be getting a fair amount of views, too. 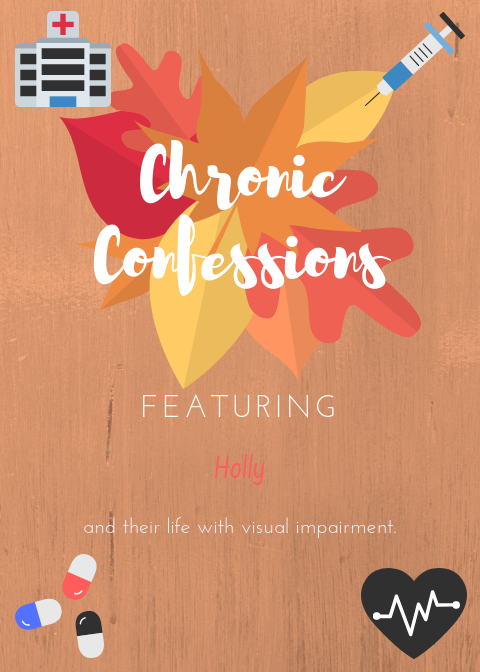 If you’ve not yet read any of my Chronic Confessions posts and you’d like to know more, head back to my introduction post here or the archive of existing posts here. My name is Holly Tuke, I’m a 23 year-old Yorkshire lass. I’m an Assistive Technology Advisor. I graduated University in 2017 with a BA Honours degree in Children, Young People and Families (it’s a long name for a degree and a bit of a mouthful to say but it’s basically a mix of sociology and psychology). 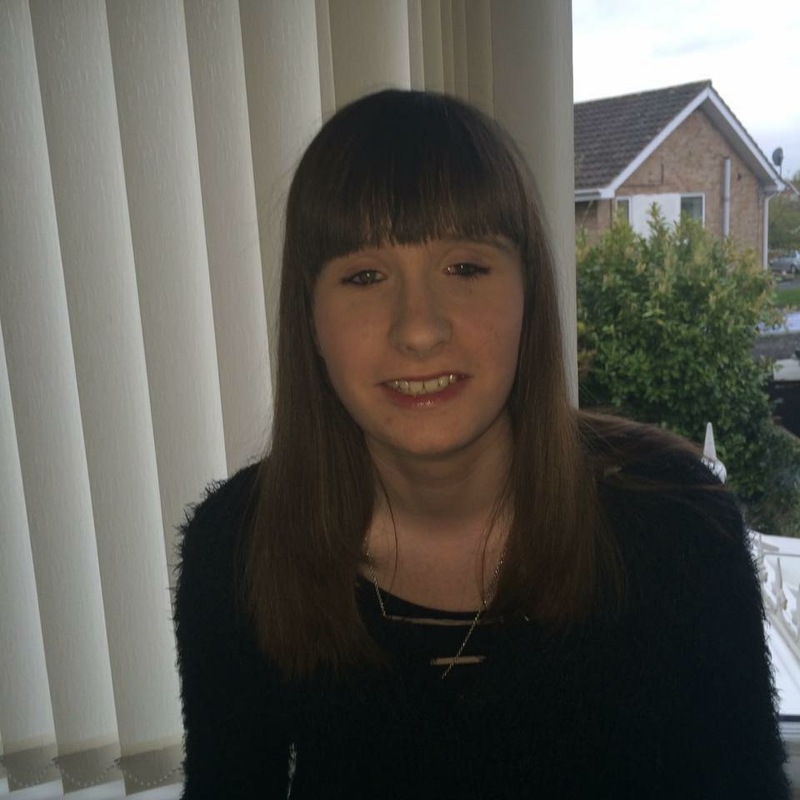 My main hobby is blogging, I run a blog called Life of a Blind Girl, I also recently started a Youtube channel to go alongside my blog so I spend quite a bit of time on those things. I love beauty and fashion. I love spending time with my friends and family, one of my favourite things to do is to go to concerts, I probably go to way too many but there’s nothing quite like seeing your favourite bands or artists live. I am registered as blind (severely sight impaired) due to a condition called Retinopathy of Prematurity as I was born at 24 weeks. Fun fact: I weighed less than a bag of sugar. Like I said, I have no useful vision and can only see light and dark. As a result of my Retinopathy of Prematurity, I have Phthisis Bulbi, also called end-stage eye. This means that I have chronic inflammation in that eye, so it is often very sore, red and can sometimes look swollen. It affects me on a daily basis and I never quite know whether it will be a good or bad day. I especially suffer in summer, it becomes more swollen and I am very sensitive to light, mainly the sun. When I started University, I was diagnosed with an overactive thyroid which then went to underactive. Although my thyroid levels are mostly stable now, I still have symptoms such as fatigue on a regular basis. As I was born so prematurely, I spent the first few weeks of my life being kept alive in an incubator. My diagnosis came very quickly after I was born, part of the hospital routine health checks were eyes, where they found a problem, that my retinas were not attached properly, this is in part due to the fact that the eyes are one of the last parts to develop, being born super early creates the problem, then as oxygen is required for survival, the retina then puts a spurt on and grows fast, too fast, and does not attach properly, this is called Retinopathy of Prematurity. 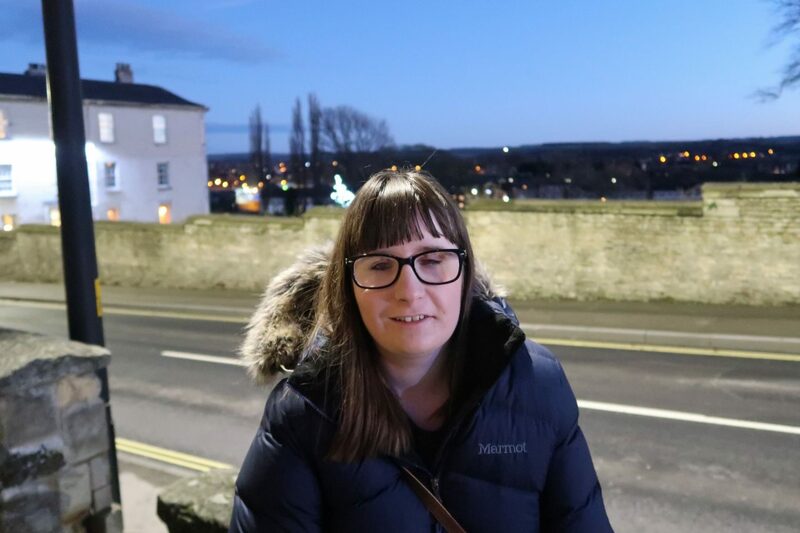 Having a visual impairment is all I’ve known, I’m not going to lie, it’s been difficult but there are also many positives, the positives certainly outweigh the negatives. My retinopathy of Prematurity is due to being born so prematurely. Phthisis Bulbi is believed to be due to the scarring that I had from an operation that I had when I was a baby, therefore, causing the chronic inflammation. When I was a baby, I had an operation to prevent my retina from detaching in my left eye, but it didn’t work and my retina soon detached. In 2017, I had to have two operations for my chronic inflammation, so far they seem to have helped it a bit. Yes, I’m on 3 types of drops for my chronic inflammation. Luckily, I don’t get any side effects. Yes definitely, my family and friends are the best! They are always very understanding, supportive and are always willing to help. I do have professionals that are also willing to help if I ever need it. 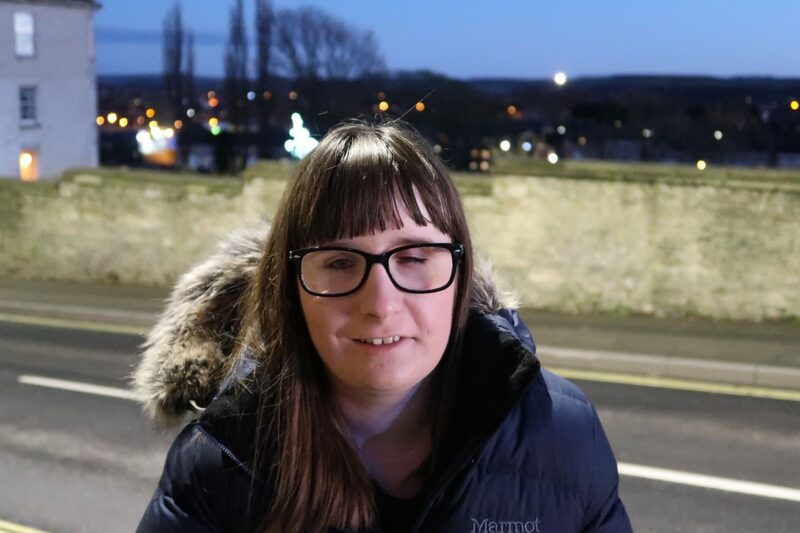 Not everyone understands disability, when I was in school people used to think that wasn’t ‘cool to be friends with the blind girl’ so I sometimes felt rather isolated. However, I do have an amazing group of friends that are fully comfortable with my visual impairment and see me for who I am, not just my blindness. I sometimes have down days. Living with a disability or chronic illness means that you are constantly fighting battles which can sometimes have an impact on your mental health. I used to suffer with a lack of self-confidence, get very anxious when asked to use a cane and feelings of isolation affected my mental health. 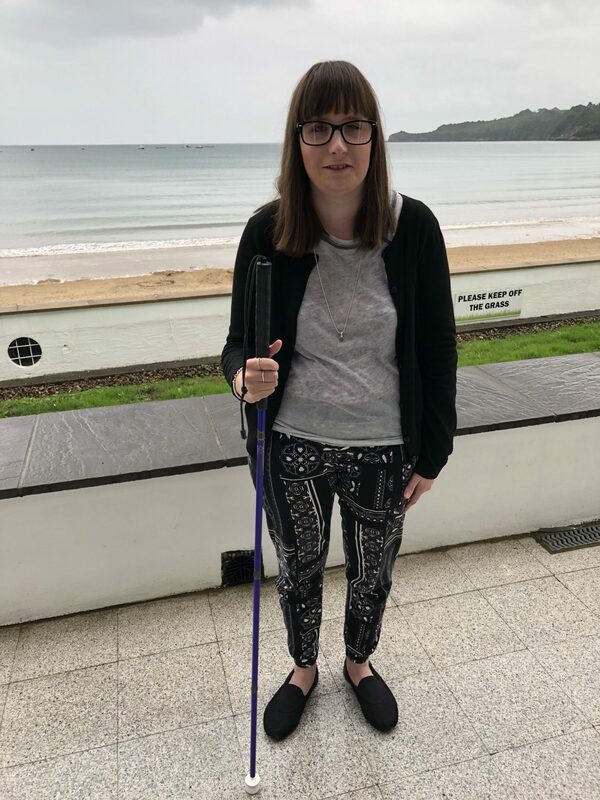 However, I am now more comfortable with my visual impairment, I am also now more confident and love using my cane so my mental health has definitely improved. What are the main things you’ve learned through having your condition(s)? There are so many things that I could write here, my vision impairment has taught me so much. Some of the things are that those who mind don’t matter, don’t feel guilty if you can’t do certain tasks and it’s all about ability, not disability. I discuss more of these over on my blog. Talk to people about it, whether this is friends, family, professionals or the disabled/chronic illness community, talking to people always helps. It’s also brilliant to meet people in the same or similar situation. It may seem bad now, but try and look at the positives. Having a disability or chronic illness might be hard, but it can also be incredibly rewarding. Seeing is deceiving, dreaming is believing, it’s ok not to be ok. Sometimes it’s hard to follow your heart, tears don’t mean you’re losing, everybody’s bruising, just be true to who you are. Jessie J – Who You are. This is my all-time favourite song. It reminds me that it’s ok to have down days, and to always be myself, no matter what. A huge thank you to Holly for sharing her story with us today! If you’d like to learn more about her or connect with her, you can find her social links just here – Blog / Facebook / Twitter. "Galentines Day Gift Ideas With Bomb Cosmetics!" "My 5 Favourite Photos Ever!" I’ve absolutely loved this series my darling! I’m going to check out Holly’s blog, she sounds like one of the most wonderful people! This got me a little bit tearful just thinking about people leaving Holly out at school and her being isolated, I can’t believe how cruel people can really be. Holly seems like a lovely girl and a great friend to have around so more fool them! I can’t even imagine how it must feel to not have one of your senses, I suppose Holly has never known any different but the thought really scares me sometimes. She has an amazing outlook on things that I think we can all learn from.